Why I can’t get cocky about my mental health. You should never get cocky about your mental health. I should know. For the most part, I’m a confident, easy-going woman. I have an amazing family and a ridiculous number of incredible friends. My life is full of an abundance of riches. And yet I’ve suffered from depression. Mental illness can strike any of us. It doesn’t discriminate. I’ve seen an 8-year-old boy crawling on the floor, barking like a dog because of a mental illness that has been made worse because of years of abuse and neglect. I’ve seen a teenager who has suffered with anger issues and hormonal imbalances all of his life, suddenly discover drugs and spiral out of control. I’ve seen a big, strong, confident man brought to his knees by depression. Thousands of stories just like these play out every day, all over the world. And yet many suffer in silence, too ashamed to admit that they have a problem. They are afraid of what other’s might think or how it might affect their position at work. And some of these fears are valid. Individuals still face the possibility of discrimination and recriminations when they disclose a mental illness. Sometimes though, people do get the strength and the courage to reach out for help for their spouse, their child, or themselves, only to be told that help isn’t available. They are often told that the wait-time for mental health services is months away. That’s too long a wait when you are on suicide watch for your 13-year-old daughter. As a teacher, I often hear those in the “back to basics’ camp calling for less focus on helping children understand their feelings, so that more time can be spent on their math and spelling skills. They say it like self-esteem is a dirty word. As any teacher knows, a student with a mental health issue is a student who isn’t learning like they could. Our first priority as teachers is for our student’s well being. End of discussion. 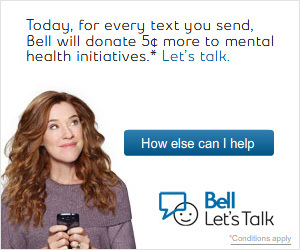 Bell Canada started the Bell Let’s Talk fundraising campaign in 2010 and has since committed to investing $62 million in Canadian mental health initiatives. Some have criticized Bell, saying their campaign is nothing more than a marketing strategy designed to promote their brand and their products. To that I say, well…duh. It’s marketing 101, not rocket science, people. But if their program helps reduce the stigma around mental health and the money donated allows more access to quicker mental health services, then I don’t care why they are doing it. You see, I’m one of the lucky ones. I have the financial means to access treatment, be it therapy, when needed or medication, when necessary. I also have the support of loving friends and family. But I know how privileged I am. Many Canadians don’t have that. 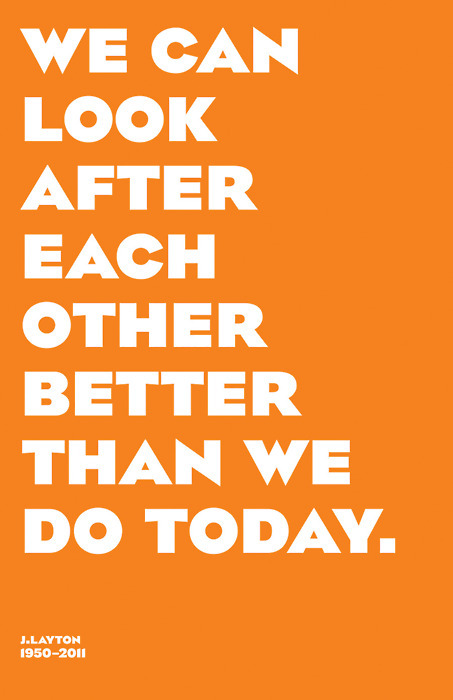 Which is why we need to be there for each other. Previous postCORRECTION: Michael Zwaagstra is a teacher, not a ‘former’ teacher. Well done a brave and honest post. you’ve journeyed a long way! I agree with absolutely 100%! When I first became a classroom teacher (after many years as a speech/language specialist), I worried that I was spending too much time with my fifth graders on the “social curriculum”. My principal was fantastic; she said, “Honey, the social curriculum IS the curriculum.” Without a sense of community and safety and respect, no one can learn anything. Thank you! You are so right. Glad your principal was on-side. Last year I spent a lot of time in health class talking with my Grade 4 students about mental health. It is part of our curriculum, thank heavens, and I found many of the kids appreciated being able to share their fears and hopes and concerns. Great post! It seems like you’re in a somewhat unique position as a classroom teacher to help children escape the cycle of stigma — if you can help them to understand that mental health issues are, more than anything else, HEALTH issues, that can go a long way toward a future where we don’t have to be afraid or ashamed to admit that we’re sick. And as for Canada … well, now I have yet another reason to justify moving there the next time I get really mad at the American political system! Canada isn’t perfect (yet) but at least we’re admitting that we need to start talking about mental health issues. I have always talked to my students in grades 4 and 5 about it. We talk a lot about stress and what causes people to be sad and the differences between being sad and being depressed. Best of luck to you and congrats on being Freshly Pressed. Hopefully this will spread your message far and wide, to people who need to hear it.